#1 Card - Straight wire teeth for raking. 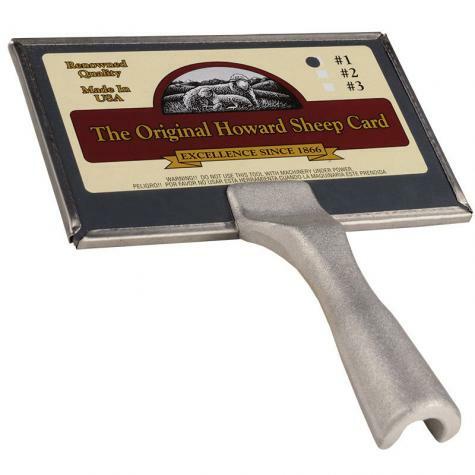 Howard cards have been the premier (no pun intended) source of wool cards for over 100 years—and can be found in nearly every sheep show box in the country. 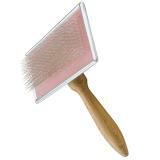 Used to bring out the wool fibers for showing and yarn making. The card number specifies the shape of the wire "teeth". #1 Card: Straight tooth for raking. Perfect for getting out all dirt and foreign matter. #2 Card: Bent wire properly set for light, open fleeces such as Cheviots, Suffolks, Dorsets, etc. #3 Card: Bent wire properly set for dense fleeces such as Columbias, Merinos, Corriedales, etc. #4 Card: Small card for use around the head, ears and legs. #6 Card: Cleaning card with curved face for use in cleaning other cards. This high-quality, durable and attractive halter can be used for sheep, llamas and alpacas. love the product. Made out of really good material. The only thing is to put a little hot glue at the corners, because they are really sharp. I know because I cut my self a few times when it slipped out if my hand and the corner rubed against my skin. 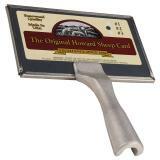 This card is perfect for brushing out wool on head and legs for show sheep! 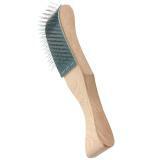 It is very sturdy made, my young son dropped it lots of times at the show and it is still good as new. My son got this card for fitting his Dorset ewe lamb that he has for his 4-H project. He is getting help from more experienced fitters and they said this is the card to have! Thank you for an excellent product.